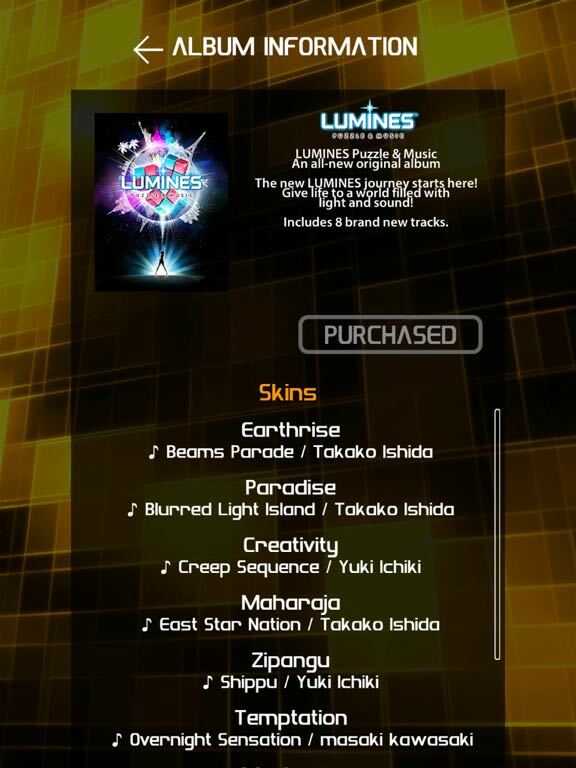 Having never been a PlayStation Portable owner, the name LUMINES didn’t strike immediate recognition for me like it does some ‘mobile’ gamers. Developed in collaboration with series founder Tetsuya Mizuguch, Japanese publisher Mobcast acquired the rights to the Lumines franchise to faithfully reboot the series for a new generation. 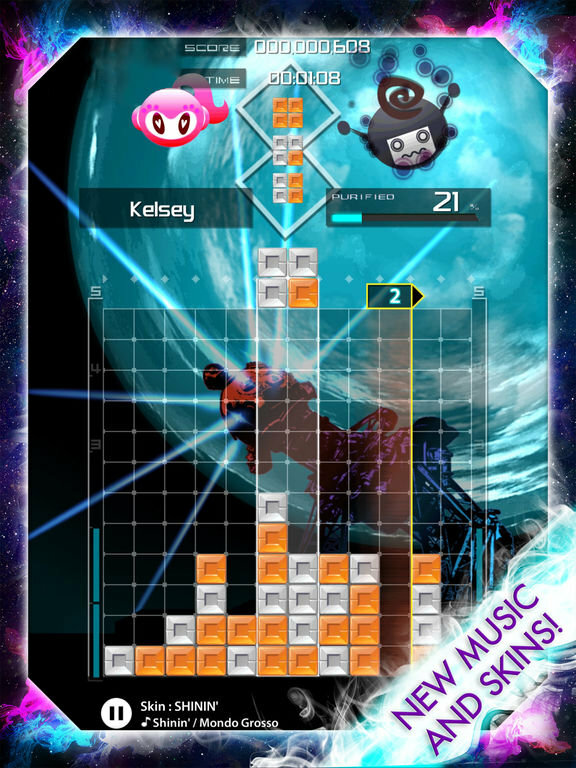 LUMINES PUZZLE & MUSIC offers the series’ familiar gameplay, but with simple touch-centric swipe and tap-based controls. At first glance LUMINES PUZZLE & MUSIC might look somewhat similar to Tetris, but once you start playing, you’ll immediately discover that it is more of an evolution of Tetris, with a unique tempo and strategy that is wholly its own. 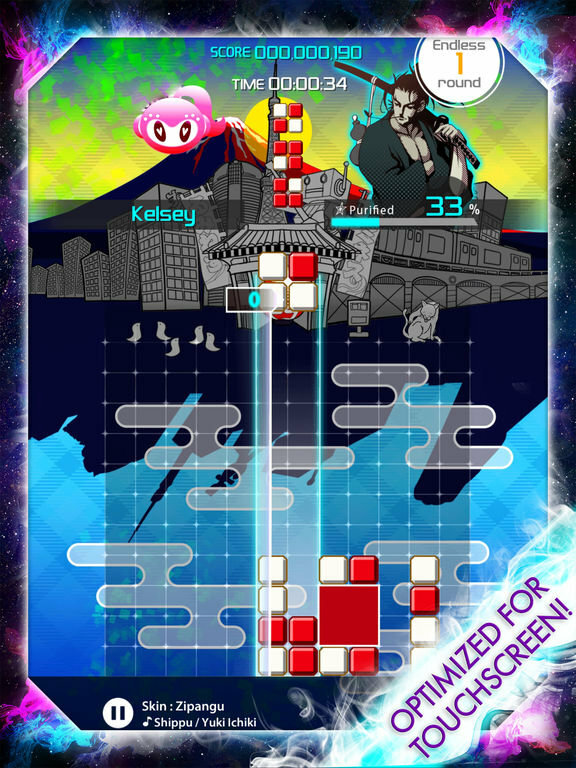 All of the pieces in Lumines are 2×2 squares composed of four smaller colored pieces in one or two colors. The goal is to move, rotate and drop the multicolored blocks to the bottom of the board to match them up with other blocks, forming 2×2 squares (or larger) to erase them. Overlapping squares can share sides or even single blocks. You can rotate blocks before dropping them, simply by tapping on them, drag them left and right to position them and finally swipe down to drop them. Dropped blocks will split apart and fill in any open spaces as they tumble downward. However, matched blocks do not immediately disappear, that’s where the real magic of Lumines comes into play. What really sets LUMINES PUZZLE & MUSIC apart from other, similar puzzle games is the “timeline” feature, which repeatedly sweeps across the playing field in time with the music. When the timeline reaches a matched block, then (and only then) do those blocks disappear, causing a chain reaction with any blocks above falling down to fill in the spaces that were left empty. Any new matches are once again marked for removal until the trash collecting timeline makes its way around again. This gives the player a short window in which to try to drop more squares to form larger matched areas to create combos and score big points. Unlike Tetris, the fear of pushing a stack of blocks over the top and prematurely ending a run seems less urgent and you have more time before the 2×2 blocks automatically drop a row on their own (while you deciding where to place them). The mad rush comes when you are trying to beat that timeline sweep to maximize your combos. You find yourself glancing at the previews for the upcoming pieces and trying to plan how to get a lot of points and clear out the most possible blocks;Contemplating how are you going to quickly rotate them and drop them all before the next timeline sweep reaches you. There are a few other special small pieces that will come up periodically which help to clear out large sections at a time and can be a real lifesaver if you managed to really muck up your columns, growing them with lots of onesie, twosie combinations that cannot easily be matched. Music and sound plays a large part in the Luminess series. All actions in the game create sounds and contribute to the music of each stage. Players progress through stages by erasing enough blocks to fill the purification meter to 100%, opening a door to a new Skin. The skins alter the appearance of the pieces in color and shape as well as switch up the soundtrack, and consequently, the whole flow of the game since the timeline sweep now followings a fresh new, (and possibly quicker) rhythm. 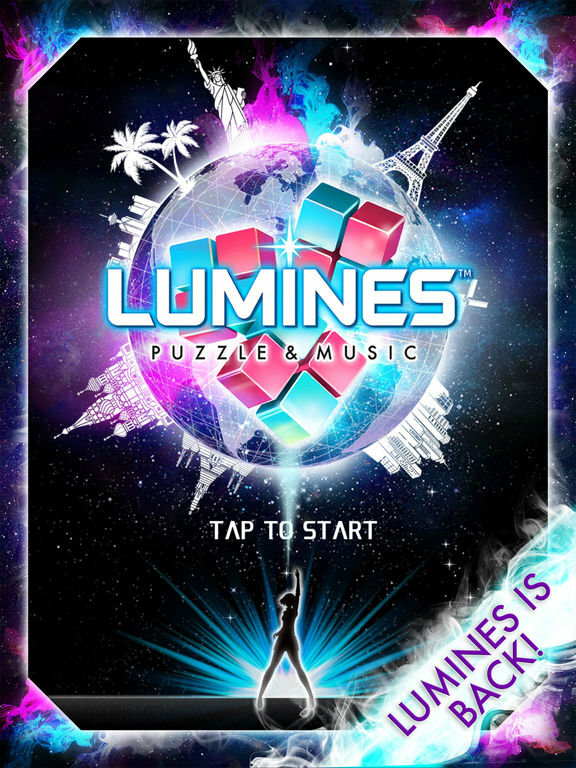 When it comes to music tracks, LUMINES PUZZLE & MUSIC features loads of newly produced ear drum thumpin’ dance tracks as well as some classics that existing fans of the series will enjoy. Headphones are most definitely recommended. With repeated play I found myself almost subconsciously syncing with the music track, relying less heavily on the visual indicator for factoring in the timeline sweep. One aspect of the game which I found refreshing, but which may be a slight sticking point for some is the length of individual stages/levels. When I was a kid I would sit in front of the Tetris for (really) long stretches trying to survive as long as possible. There was no such thing at ‘blitz’ mode where you played for a minute and you were done (I blame the short attention span Millennials for this). You can expect a meaty 10+ minute playtime, not an abbreviated and crammed experience. And with multiple game modes per song/skin, there is a lot of replayability, especially if you go for all of the achievements and/or try to show your dominance on the leaderboards. LUMINES PUZZLE & MUSIC was a rather enjoyable experience. I went into this one not knowing what to expect and even for someone who has never played a Lumines game before, it delivered a nostalgic and classic feeling puzzling experience. The game fills a void left by many publishers insistence on transitioning their classic mobile franchises to quick, forgettable one minute experiences. If you are a fan of classic puzzle games, then you should definitely check this one out.